Masters of Table, a Table Tennis tournament, was organized to satiate IIM Indore EPGP participants’ appetite for sports, rejuvenating them while also building team spirit. The tournament, which is the first sports event conducted by EPGP this year, was organized in a manner such that each and every member of EPGP was the part of a Doubles team. As a result, the tournament had 20 participating teams, of which 5 teams were Mixed doubles teams. The two best teams of the tournament reached the Finals which was held on 30th June, 2016. 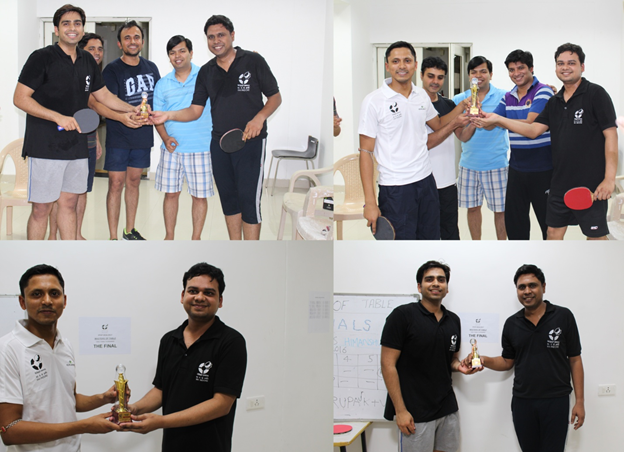 The team of Rupak Laskar and Vivek Srivastava prevailed over the team of Himanshu Makkar and Karthikeyan M in a nail-biting finish, to become the first Masters of Table. The Winners and Runners-up were presented the trophies by our esteemed guest Mr Vijay Dadlani, Officer, IIM Indore Sports Complex. Mr Sudip, Mr Ajay and Mr Shantanu who organized the tournament gave a vote of thanks to Mr. Vijay Dadlani and all the participants, for making the tournament a very successful and special one.